This article was re-published on November 22, 2017 and is a replacement for a previous article contributed by Charles-David Racine in January 2012. Rich snippets are an excellent way to stand out from the competition in search results. Increase in organic visibility: your snippet will take up more space in search results, and be more eye-catching. Increase in CTR: in addition to enhancing visibility, the extra elements displayed in a rich snippet, like ratings, product pricing and availability are incentives for users to click through to your site. Increase in conversions: thanks, for example, to the ratings displayed in your snippet that lend additional authority to your product/service. But that’s not the only advantage. The main function of a search engine has always been to present users with a list of results that match their search intentions as closely as possible. However, the robots used by search engines don’t understand English or French. For them, words are just a string of characters. All it takes is one ambiguous search to understand what I mean: if I type Turkey on Google, am I talking about the country? About the animal? About a recipe? Difficult to know… Now, if I start a new page that I call “Turkey” (yes, it’s a funny page name), how will the search engine know which turkey I’m talking about? It will make use of the context, the words I use, the URLs I point to, etc. And that’s where the semantic games begin. Simply put, semantics is the study of the core meaning of a text (the meaning of a group of words) as opposed to syntax, which is the study of the arrangement of the text (the way in which the group of words is constructed). Recently, in reading articles on structured data, I came across Mike Arnesen, and one of his quotes really stuck with me. “A web without semantic markup has no common language.” Yes! 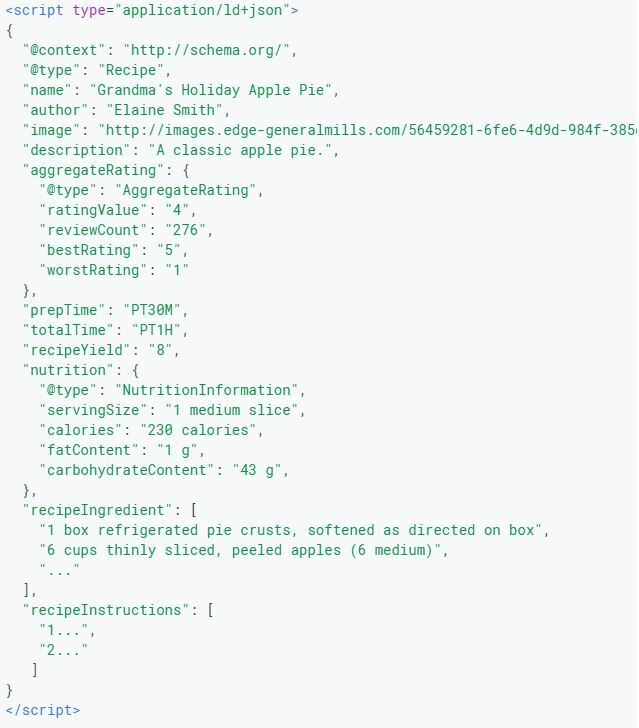 With structured data, we use specific properties that search engines can understand, and in doing so we improve the way search engines interpret the content of our pages by clearly indicating what those pages are about: a phone number, an address or the cooking time of a recipe, for example. In 2009, Google launched rich snippets. In 2011 it partnered with Microsoft, Yahoo and Yandex to launch Schema.org, a protocol that centralizes the information related to structured data and the semantic web. Though in 2017, while structured data still isn’t used for the majority of websites, it offers great opportunities to prepare for the future. According to the Internet Trend Report 2016 by Kleiner Perkins, at least 50% of online searches will be done either by voice or by image by the time 2020 rolls around. The nature of voice search is that queries are longer. Structured data, because it makes your content easier for search engines to understand, is an excellent way to prepare for this coming reality. In concrete terms, what are rich snippets and structured data? A rich snippet is a search result that’s been enhanced with additional information beyond the title, URL and meta description. There are several types, and you’ll find the most popular usages below. The supplemental information presented with the search result varies depending on the type of content, and is retrieved using structured data. Multiple structured data formats exist (JSON-LD, Microdata, RDFa). For technical details, you can refer to Google’s support guide. A featured snippet (or “position zero” in SEO jargon) refers to the page extract that’s sometimes featured at the top of the search engine results page. It responds to a particular question, and allows the user to find the information they’re looking for directly in the results. Its placement might change depending on the query, but it’s always given far more visibility than standard results. If you want to know more, I would strongly suggest reading the excellent article written by my colleague Pierre-Olivier Boucher. Note that Google reserves the right not to post some structured data depending on the query. For products, for example, the price doesn’t always appear. The URL is replaced by breadcrumbs corresponding to the architecture of the site. Aggregation of rating, number of reviews, price and availability. Aggregation of the overview, rating, number of reviews, preparation time and number of calories. Note that by setting up structured data for recipes you are also able to display rich pins on Pinterest. Aggregation of number of reviews, date, location and event name. Google may also display site links, as is the case here. Aggregation of the rating and number of reviews. Note that there are also other types of rich snippets, like videos and those available for courses, that are currently displayed on mobile-only for the time being. As explained earlier, rich snippets are never guaranteed to display, and there can be a number of reasons why your rich snippets might not be showing up in search results. For example, a site like Amazon doesn’t use structured data at all. In the past, certain rich snippets would display (like the one below) but that’s no longer the case. Amazon has no official position on the subject, but a few theories exist. How can you use structured data to set up rich snippets? In terms of setting up structured data, you have three formats to choose from: JSON-LD (recommended by Google), microdata and RDFa. You’ll find a brief description of each format and related references (mainly in English) at the end of this article. Identify the microdata format best suited to your situation. List the relevant fields starting with your priority elements: including which schemas will and will not appear in your rich snippet. The Person schema, for example, can be extremely interesting for featured snippets, but won’t appear in rich snippets. Set up your microdata and observe how Google treats it, using Search Console. At first glance, the world of structured data can seem complex: it’s true that this type of tactic lives at the crossroads between SEO and web development, because it requires you to create a markup structure that can be automated for each page where structured data might be relevant. But Google’s help center on the subject is extremely comprehensive. It gives concrete applications and examples for each rich snippet. It offers a structured data testing tool that will help you understand how Google interprets your markup. Google also offers a data highlighter that you can use to mark up your data easily. If the site you’re working on already has structured data, you can use the report available in Search Console, it will allow you to verify that Google is reading your structured data correctly, and that it contains no errors. If you want to learn more on this subject, I would strongly suggest the excellent structured data guide written by Bridget Randolph for Moz. For structured data that isn’t used to create rich snippets, the work is long and cumbersome. Its usefulness really depends on the industry you’re in, but it could be useful to try it for queries with strong potential for visibility, because it might put you at an advantage for being displayed as a featured snippet. One thing is certain: semantic markup is going to take up more and more space in the world of search in the years to come. Microdata used to be the most commonly used format. Most of the examples on schema.org use microdata. It’s relatively simple to use, but it’s major disadvantage lies in the fact that it’s related, like RDFa, to your HTML elements. In other words, you will need to add additional markup to your HTML. RDFa is an extension of HTML5 that handles structured data by introducing HTML markup attributes corresponding to the content visible to the user, that you want to describe to search engines. More complex than the microdata format, it presents the same disadvantage, that the markup needs to be done right in the HTML. Following his studies at the École Européenne des Métiers de l’Internet in Paris, Clément first worked at a start-up before becoming a freelancer specialized in WordPress and SEO. He is now a part of the Content Marketing team and works primarily on SEO projects, with a eye for detail and a strong interest for web semantics.